"Published the year after his Pilgrim's Progress, in 1679, Bunyan's Treatise on the Fear of God takes a widely misunderstood and neglected theme, wipes off the grime of confusion, and lets it sparkle. And sparkle really is the word: where most assume that the fear of God must be the gloomy theological equivalent of eating up your greens, Bunyan shows what a delightful and helpful subject it is." 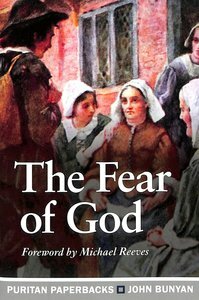 About "The Fear of God (Puritan Paperbacks Series)"
This devotional selection from I.D.E. Thomas forms an ideal introduction to the writings of the 17th centurys greatest and most godly men. TC95BOriginally published in 1671, this is one of the greatest evangelistic books ever published, still as relevant today as 300 years ago.Joseph Alleine One of the greatest evangelistic books ever published, anda great spur to personal evangelism, this book was originally published in1671 under the title AN ALARM TO THE UNCONVERTED. 148 pages, from Bannerof Truth. Numerous stories are told from John Flavel's life of how people just 'happened to meet him' and yet came away deeply thankful to God, full of resolve to walk with Christ as a result. The same is true of encounters made with Flavel's writings. Flavel spent almost his entire ministry in a busy town serving working people. He believed that the gospel impacts and shapes every thought, every feeling, every ambition, emotion, desire, success, tragedy and joy. Christ makes all things new for the believer, and teaches us to follow him with confidence, until that day when he truly renews all things. To read Flavel is to catch and to be changed by the same vision. Selected and Edited by Lewis Allen. By 'lot', Boston means our 'lot in life', the shape of our lives as they are styled by God's many providences. By 'crook', he means those unforeseen troubles that afflict, unsettle, or disturb us in any way. Boston sets out to minister pastoral wisdom and help to God's people experiencing what Paul calls 'the sufferings of this present time' (Rom. 8:18). The Crook in the Lot is pastoral medicine prepared in the laboratory of Boston's own personal and ministerial sufferings. It is little wonder that Jonathan Edwards considered Boston 'a truly great divine'. He was indeed!" Duties of Christian Fellowship deals with a matter of perennial concern for every truly Christian church. In just a few pages it sets out in very concise terms the responsibilities all Christians have, first, to their pastors, and then second, to one another within the fellowship of the local church. John Owen (1616-1683) was a pastor as well as a theologian and therefore this is a most practical manual of church fellowship. It was intended to be read by individuals with self-examination, meditation and prayer, but it would also be very suitable for group Bible study. This edition is enhanced by a modernized text and the addition of questions for group discussion. Expected to ship within 10 hours from Australia.